Sarah passed peacefully in her home on July 31st 2012. Art-in-Transition is now complete, and will remain together with all of her works as a legacy to be shared by all. It is hoped that Sarah’s work will inspire those affected by Alzheimer’s to explore their personal talents and skills into a tool of healing and solace. Sarah was born 1931 in La Jolla, California, and was raised in Santa Monica California. Her childhood and formative years was very influenced by the Southern California beach environment. She earned a Bachelor of Arts degree at USC Berkley California and worked as a draughts woman for GTE and MacDonnell Douglas Aircraft. She raised her family in a house by the ocean at Las Flores “Dog Beach” Malibu, California. Sarah and her first husband James Wallace who was an MD were greatly influenced by the changing conciseness of the 60s. Dr Wallace passed in 1972. She adjusted to her new role as a single parent using her love and creative awareness to provide for her family needs. Sarah’s ongoing love of the ocean, and as an ardent beachcomber, continued to influence treasured family memories, and over the years she expanded a collection of rocks, shells, driftwood, and ocean artifacts. Sarah met Ivan in 1981 and they moved to Langley, Washington in 1984. 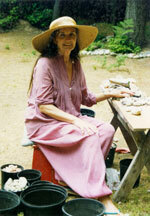 Sharing her new life with Ivan Neaigus, together as artists, they became a part of the Whidbey Island art community. During this period Sarah produced a substantial body of work. In 1994 she was given first prize at the Chocokum Festival of the Arts (Sea Tree 1), and participated in various shows and Art Tours. In December of 2001 Sarah was diagnosed with Alzheimer’s. Ivan and Sarah began to deal with the challenge of their situation. Ivan tried various ways in creating quality time for Sarah. In November 2006 with the input of the studies by Dr Cameron J. Camp Ivan re-organized Sarah’s studio into a shared working space and Sarah began a new body of work named “Transitions”. The studio became a refuge space for Sarah, and it made a major impact to her life. Unlike her previous work of stylized realism, the new work is totally abstract. The works numbering 1-32 (representing the sequence of execution), previous works and numerous editorials can be seen on the web site www.art-in-transition.com. In addition 13 more works were done from 2010 to Sarah’s passing, with the last work #45 being unfinished. Since 2001 Sarah has been participating in “Time Together” a respite program at the Bayview Senior Center in Langley, WA. The program was an important part of Sarah’s life and helped tremendously in giving her a social connection. Sarah was known as the dancer. Her spontaneity and spirit always added Joy to all, and she will be surely missed. Her work and her being will always be with us. The "Transition" and "Completion" works are being reproduced in Giclee Prints, and will be offered for SALE in unlimited editions (see Gallery page). From the sale proceeds there will be a 10% contribution to the Time Together program, and 10% to Alzheimer's research.